As some of you may have noticed, I have something of a tendency to group my Discworld and Dresden Files reads together. In this case, I am following Reaper Man with Death Masks, which felt kind of thematically appropriate somehow. 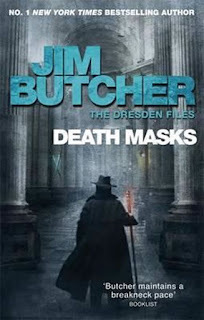 And honestly, I was looking forward to the next Dresden Files so much after the series had its ante upped during Summer Knight that I couldn't have resisted for long. By the time Death Masks starts, the war with the Red Court of Vampires has been going on for a couple of years, with progress on either side more or less grinding to a halt. With this in mind, Dresden is approached by Count Ortega, who puts forward the following offer: agree to a fair one-on-one fight with him and potentially end the war for good, or he'll send hired guns after Harry's friends and former clients. On top of that, he is hired to find the Shroud of Turin after it has been stolen. While what seems like a comparatively mundane case soon proves to be anything but when demonic beings known as the Denarians show up, with Michael and his fellow Knights of the Cross determined to keep Harry out of harm's way. I don't really know how Butcher intends to top Death Masks, because I loved this from start to finish. First, the reader is introduced to new characters that I can't wait to see more of. There's Butters, the night-shift mortician blaring out polka, who is surprisingly calm about the fact that the supernatural is real now. There is Ivy, a little girl who contains the entirety of written knowledge but still insists on sticking to an appropriate bedtime. And, my favourite, there is Sanya, the newest Knight of the Cross, one of God's chosen few, who still maintains a position as an agnostic and has little time for the old fashioned trappings of the Order. Second, it develops some of the existing side cast nicely. Michael doesn't come across nearly as sanctimoniously as he does in Grave Peril, as he is balanced out by the other Knights of the Cross. Susan, while still far from my favourite character, doesn't feel like dead weight anymore; turns out she just needed to be turned into the undead to contribute something to the series beyond a target for Harry's emotional pining. And, be still my beating heart, I get to see more Johnny Marcone being more than capable of standing toe-to-toe with supernatural foes, as well as an unexpected emotional side. Third, it introduces some great villains in the Denarians. They are seriously scary already, and I doubt that I've seen even a fraction of what they're capable of. The idea of an entity that takes over people through their own temptation is really unnerving, as is the fact that they're at such an obviously higher power scale than anyone Harry's had to fight before, with the exception of the Fae. Count Ortega is also an interesting villain, but he does kind of pale in comparison to the Denarians.